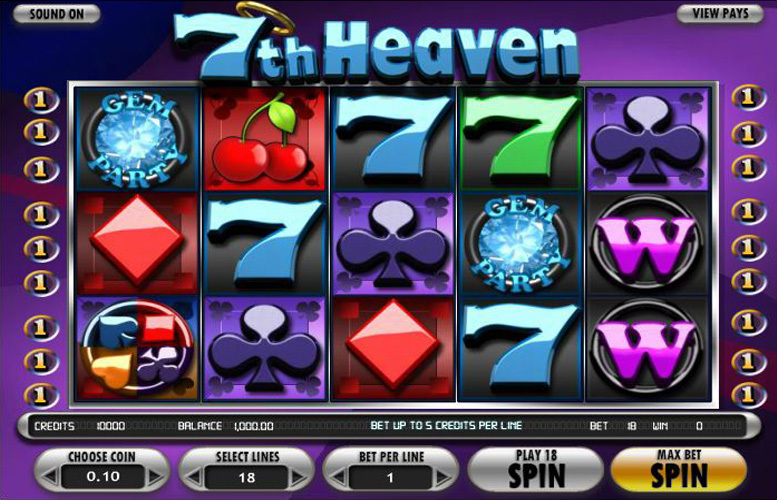 7th Heaven from BetSoft is a kind of average slot machine to look at and to play. As is often the case when designers try to fondly nod back at classic casino gambling, the result is a bit lacklustre on a laptop in 2017. That said, it’s not a terrible game by any means. There are much worse that take this kind of approach and fare far more poorly at it. There are a few bonus features, and one’s rather exciting but all told, the game doesn’t quite have the spark of some of BetSoft’s other titles. It’s also not much of a looker either. Some good bonus features. 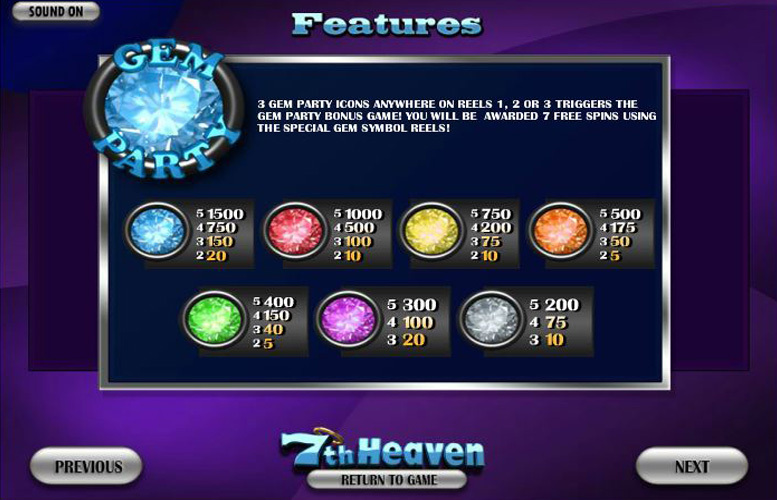 We particularly like the Gem Bonus with free games being played on a fresh gameboard. Overly simplistic style. Some people might like this approach but we know that BetSoft have some pretty handy animators on their team, and they’ve clearly been overlooked here. Very low maximum bet per spin. A lot of recreational players won’t notice this but serious high stakes grinders will find £90 a spin too low. Red seven = 5,000x the line bet. Blue seven = 3,750x the line bet. Green seven = 2,500x the line bet. Liberty bell = 1,500x the line bet. Cherries = 1,250x the line bet. A max bonus of 25,000 coins is available if playing 5x the line bet on the maximum bet level. Landing the W “wild” symbol on reel two, three, or four completes and doubles any combination of 7s possible. That’s not all though. When the “wild” completes a winning 7 combination, it expands and covers the entire reel. The Colour Wheel Bonus (as we’ve called it) is triggered by landing the heart/spade/diamond/club symbol on reels three, four, and five simultaneously. When this happens, a colour wheel will appear, and will award players between seven and 12 free spins. 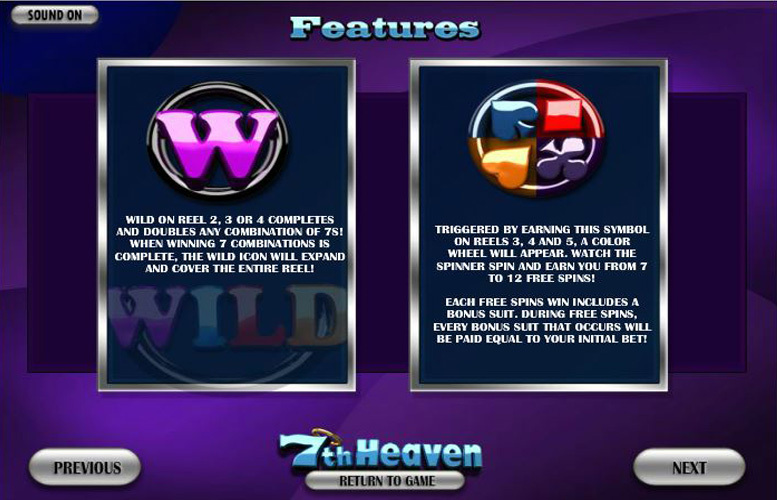 In addition, each free spin win includes a bonus suit. During the spins, every bonus suit that occurs will be paid equal to the initial bet. This occurs no matter where on the reels it lands! Blue gem = 7,500x the line bet. Red gem = 5,000x the line bet. Yellow gem = 3,750x the line bet. Orange gem = 2,500x the line bet. Green gem = 2,000x the line bet. Purple gem = 1,500x the line bet. Grey gem = 1,000x the line bet. Hearts = 1,000x the line bet. Diamonds = 750x the line bet. Clubs = 500x the line bet. Spades = 375x the line bet. BAR = 250x the line bet. 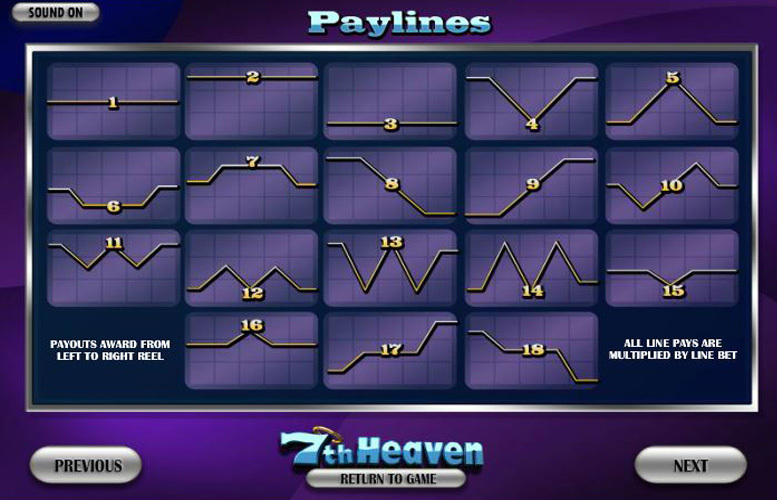 Players have total control when deciding how to distribute their money across the reels on 7th Heaven. They can adjust the number of win lines they use, and the number of coins they oneach . In addition, they can choose the value of each of their coins. There are between one and 18 win lines, bets can be between one and five coins on each, and coins can be valued between 2p and 50p. When all these values are set to the minimum, the lowest possible bet per spin is just 2p, and when totally maxed out, the highest bet per spin is £90. 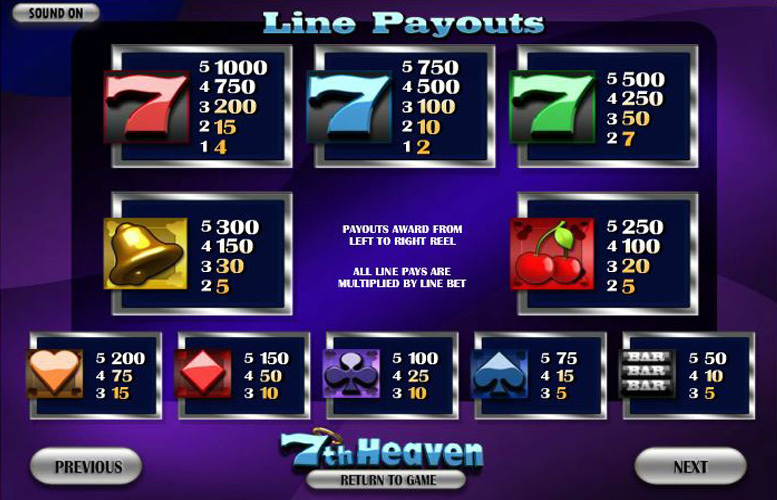 Like with many other BetSoft machines, 7th Heaven doesn’t cater for those with the biggest bank rolls. 7th Heaven isn’t the most exciting game around. It suffers from an overly simplistic theme, and a lack of innovative bonus features. Whilst many won’t find a great deal to hate about it, there’s also little to love. We’ve seen much better from BetSoft, and 7th Heaven with its limited features, lack of animations, and dated theme falls short of the standard the company have set for themselves. All that said, however, it does have an excellent return-to-player rating. This game has a rating of 3 / 5 with 428 total reviews by the users.